Tours in the Croatian region of Southern Dalmatia, which is the smallest and most sparsely populated part of Croatia, will take us past unique little towns and the beautiful island countryside. 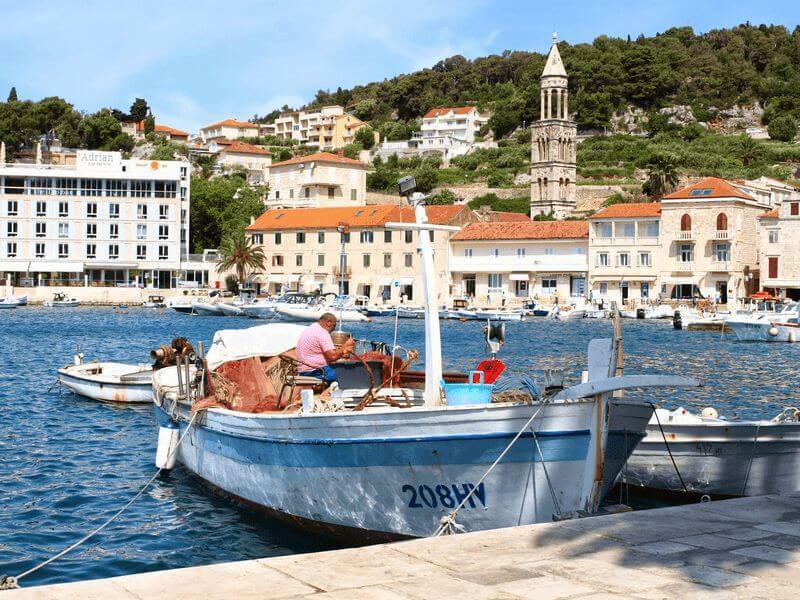 These tours will let us experience the beautiful island of Korčula with its picturesquely situated old township and the beautiful lavender island of Hvar. 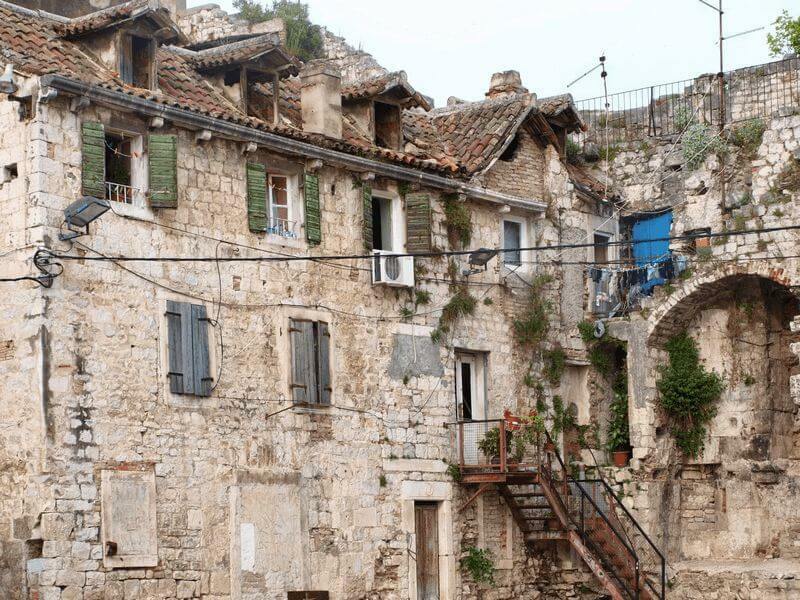 Stroll around Hvar town with its mighty fortress and enjoy the calmness of the artists town Stari Grad. Our tour guide explains us the towns of Trogir, Hvar, Stari Grad and Korčula, which are almost all protected under UNESCO‘s World Heritage list. 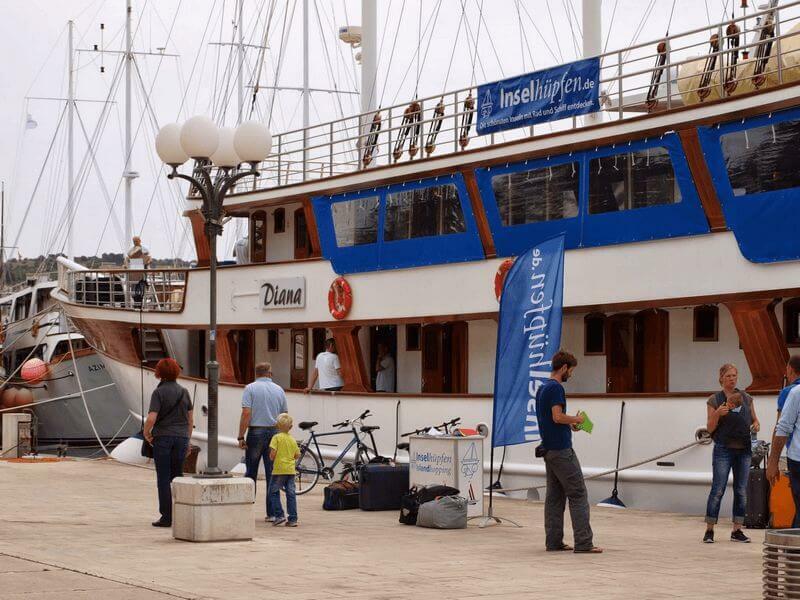 This tour is occasionally offered parallel to the mountain bike cruise in Southern Dalmatia on the same boat. In this case one tour guide will cycle with the mountain bikers while the other will accompany the trekking cyclists. Due to changing wind and weather conditions as well as organizational requirements the tour could be conducted in reverse order. Parallel to some of our Southern Dalmatia tour dates we are also offering our Southern Dalmatia PLUS tour with one of our first class ships Princeza Diana or Melody. 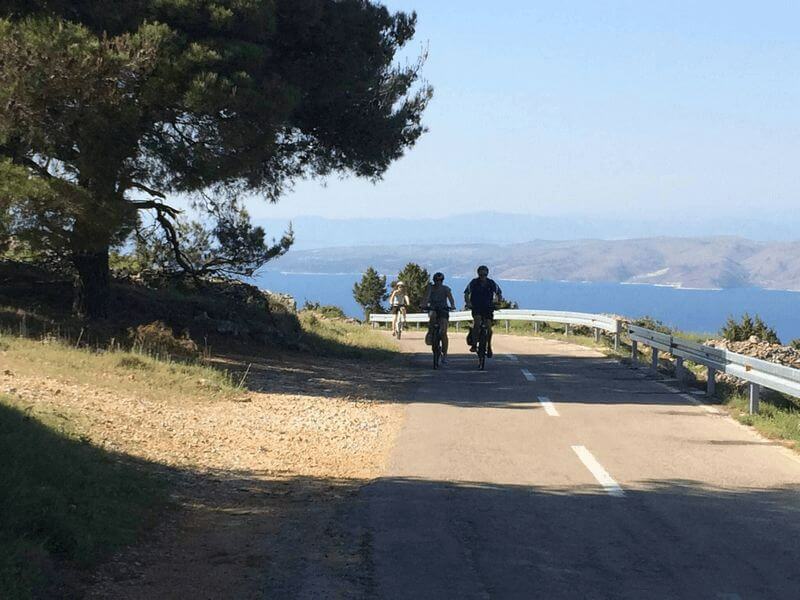 On this tour E-bike- and hybrid bike rides are conducted parallel – the itinerary is similar. Therefore the PLUS tours would be the perfect alternative if the desired tour date on the regular tour is already fully booked or if you are looking for a tour on an even more luxury boat. The tour details are barring changes, a.o. as a result of nautical, technical or meteorological reasons. We reserve the right to make changes to the planned itinerary due to changing wind and weather conditions as well as organizational requirements. If necessary the tour will be operated in reverse. 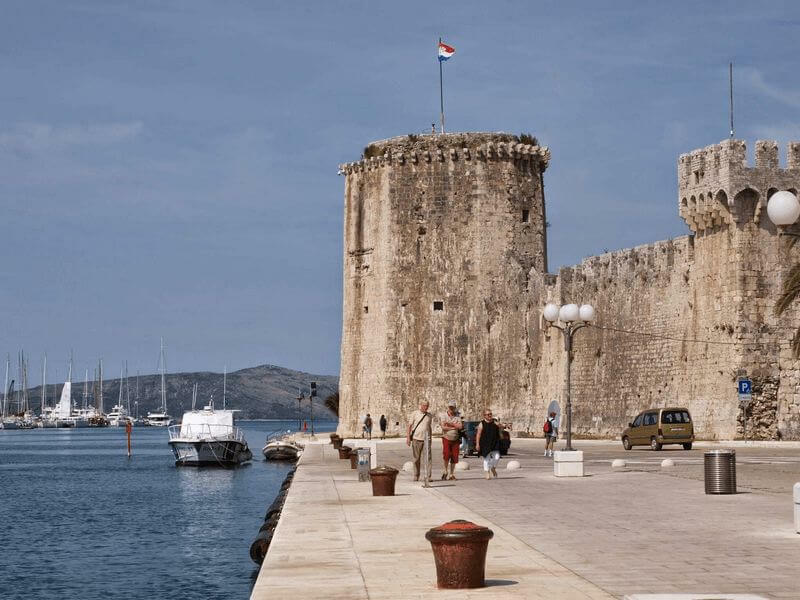 Individual arrival by car to Trogir or by plane to Split airport, which is about 5 km/3 mi. away from the harbor of Trogir. 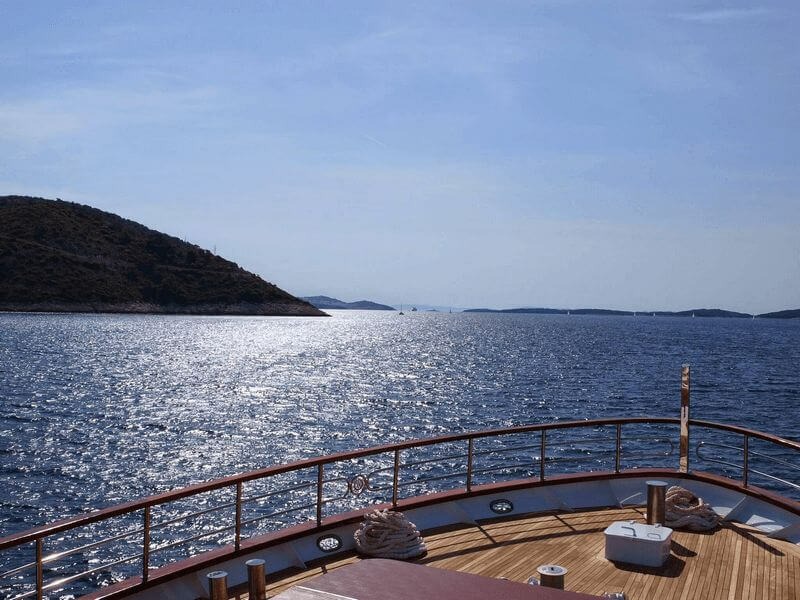 After check in on the motor yacht between 2 and 2:30 pm the first cruise starts about 3 pm from Trogir to Šolta Island. Overnight stay in the sedate harbor of Stomorska. On Šolta we commence in the morning our first tour. Walled fields, numerous olive groves, locust bean and fig trees line the roads. The herbal scent of rosemary accompanies us along our tour across the island. After cycling around the island we return to our ship in Stomorska and cross over to the lovely natural harbour of Stari Grad. 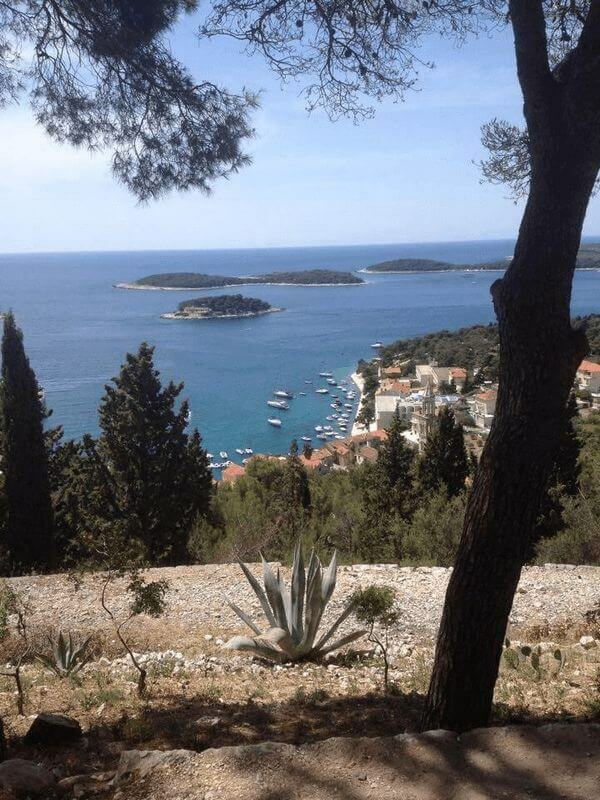 Our afternoon cycling tour on the Island of Hvar leads us through the quaint harbors of Jelsa and Vrboska. Afterwards we return to Stari Grad for our overnight stay. 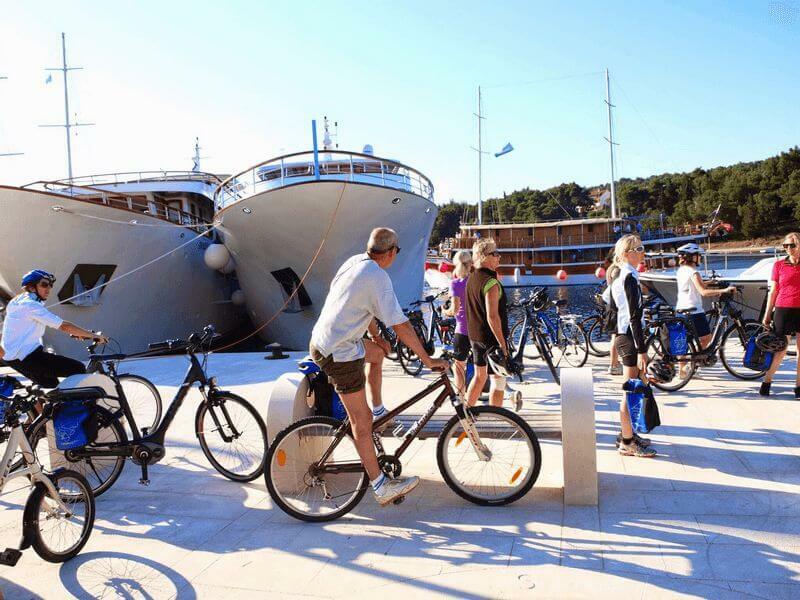 Today we discover the island of Korčula by bicycle and enjoy our lunch break in one of the local restaurants. The calmness and remoteness of the vast vegetation and cypress gardens have given the shape to the probably most beautiful Dalmatian island. 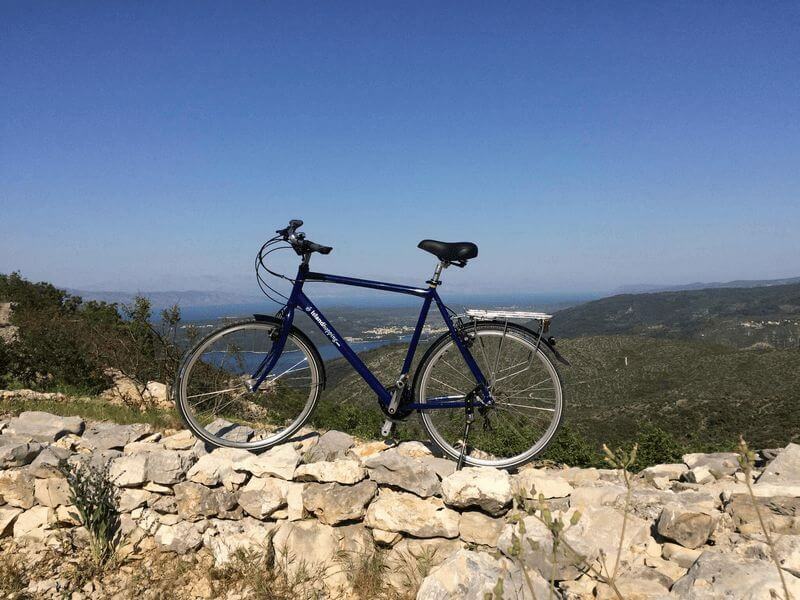 Our cycle tour leads us via the village of Blato, like Rome build on seven hills, along a pass road across Pupnat bay and finally to Korčula town, where we have time to take a walk through the wonderful old town with its narrow “fishbone like” alleys. We stay overnight in Korčula town. 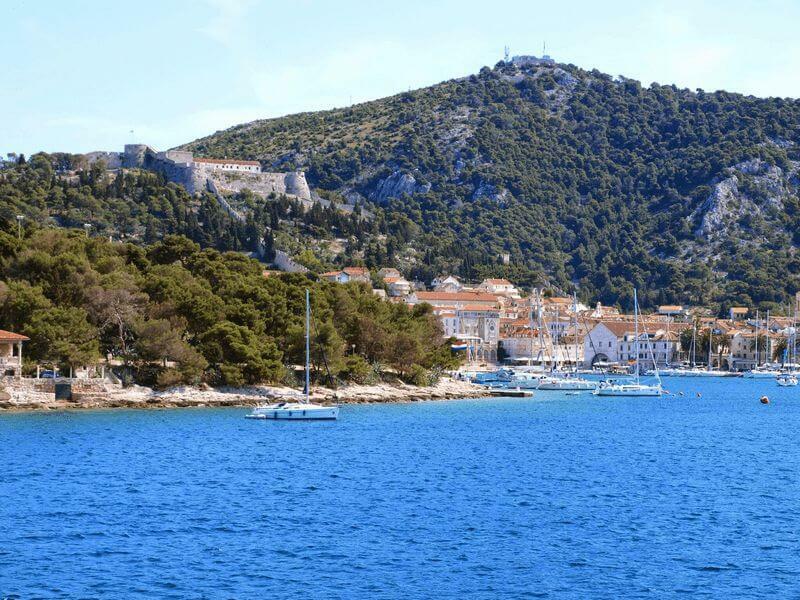 Today we cruise to the island of Brač, which is famous for its radiant marble that was, among others, used for the White House in Washington and the Reichstag building in Berlin. After an extended swim break followed by lunch, we start our cycling trip in Sumartin, leading us to Selca and on to the picturesque harbour town Pučišća. 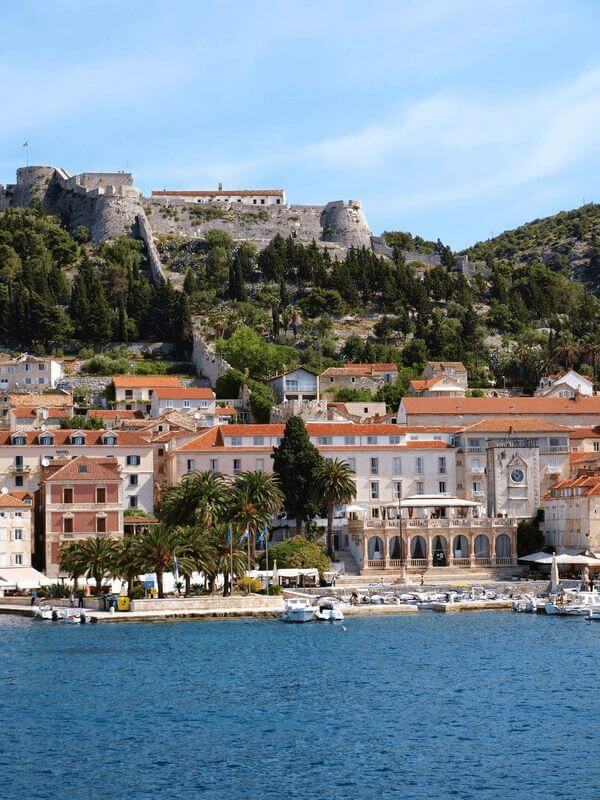 The picturesque harbor is home to one of the most famous masonry schools in Croatia. The creations of the students decorate the harbor village. Overnight stay Pučišća. After a morning crossing to Omiš we cycle through the valley of the Cetina River which is surrounded by steep rocks. After 11 mi./18 km we have the choice to take part on a four hours rafting tour on the Cetina River (not included in the tour price) and afterwards a short cycle tour of about 5 mi./ 8 km back to the boat – or to expand the cycling tour (no rafting) to 27 mi./44 km along small side roads and versatile landscapes until reaching Omiš and its pirate castles. In the afternoon our ship takes us to Split. 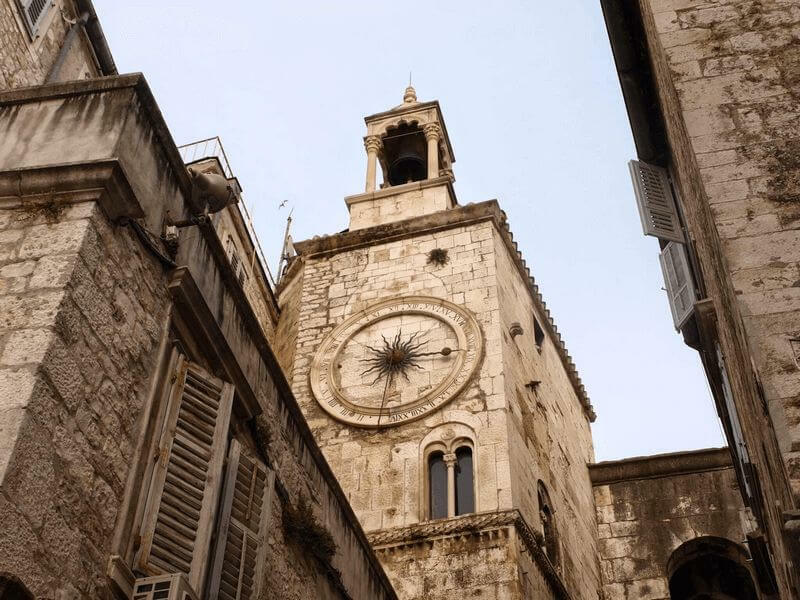 The old town of Split, built adjoining the famous palace of the Roman Caesar Diocletian, is a world heritage site. Overnight stay in Split. In the morning we prepare for our last bike ride to Mount Marjan. 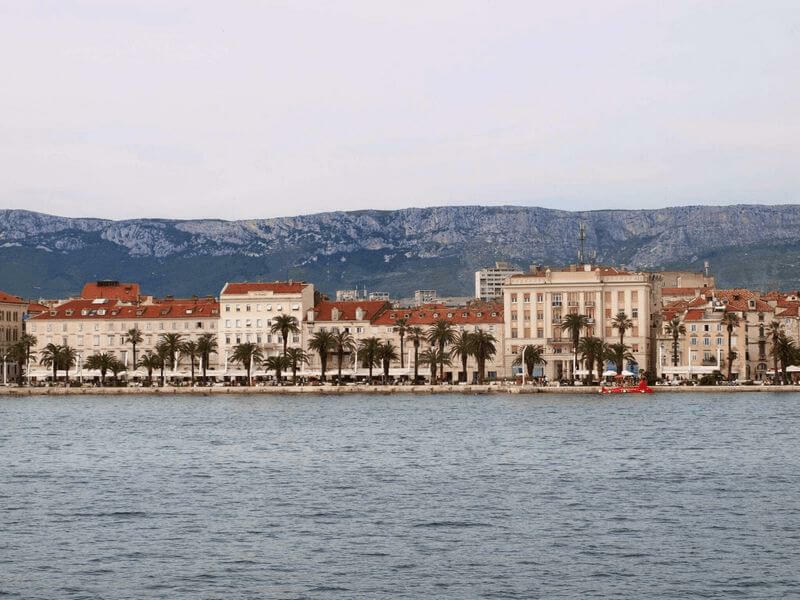 A popular recreational site for the residents of Split, which offers fantastic views of the city and the surrounding islands. Afterwards we board the ship and enjoy the last crossing to Trogir. There is still plenty of time to visit the Old Town, listed as a World Cultural Heritage site. The last evening aboard our ship is celebrated in traditional fashion. While enjoying the communal dinner in a celebrative atmosphere we will have the chance for a last get-together with our crew and tour guides. After breakfast disembarkation until 9 am and individual departure. The cycle tours require at least basic level of fitness from participants, which they should have acquired from steady cycling. The tours will take us up to a height of 200 to 650 m above sea-level. The day-tours from 12 mi. to 37.5 mi. (20 to 60 km) will take us through hilly and mountainous terrain and will be completed without any time-constraints. Participants will also need to master long and steep climbs, during which they are, however, also permitted to push their bicycles. We traverse mostly asphalted roads, which are rarely traveled on outside the holiday seasons. 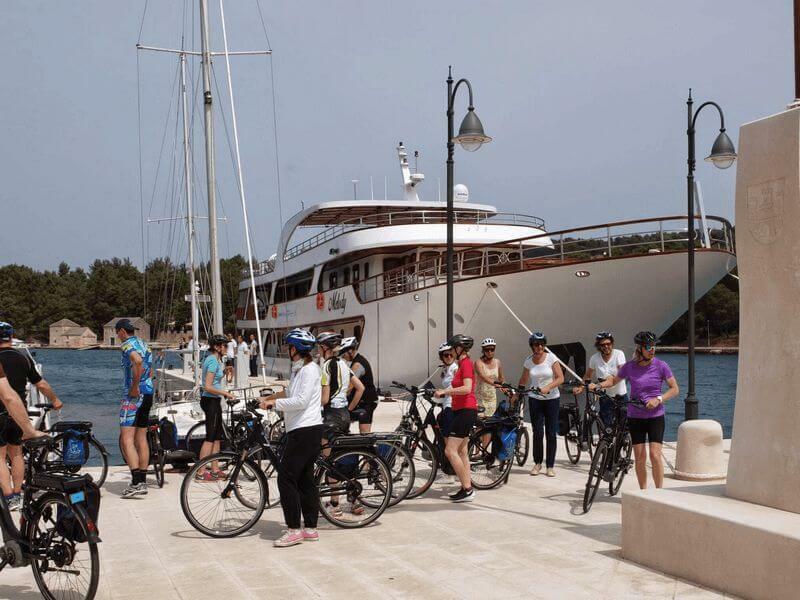 You are free to set aside a half or full day to swim or spend on board the boat, instead of taking a planned cycle tour. Helmet use is mandatory on all cycle tours. You are strongly encouraged to bring your own (well-fitted) helmet. Rental helmets are available in limited numbers (reservation requested). Romantica: on April 20; May 4 and 18; June 1, 15 and 29; July 13 and 27; August 17 and 31; Sept. 14 and 28; Oct. 12. • You can book a cabin for three persons and get a 50 % price discount for the third person (regardless of age, not combinable with any other discount). These cabins are furnished with a double bed and a single bunk bed above. If the cabin is situated on deck, we will not charge the above deck surcharge for the third person. • Children up to age 16 receive a 25 % discount on the basis tour price (not combinable with any other discount). Surcharge for single cabin use will be added. Helmet use is mandatory on all cycle routes. You are strongly encouraged to bring your own well-fitted helmet. Rental helmets are available on board in limited number (reservation requested). Kapetan Jure and entire staff, especially Miren and Fran were wonderful! Wooden motor ship San Snova is constructed entirely of oak. This ‘Dream of dreams’ was built as family project by the Scherka family in their own carpentry workshop. And this is what you will notice when you come on board; everything is done with craftsmanship and passion. Modern comfort and functionalism are combined with elegance and style. The captain and his crew are proud to welcome you aboard. You’ll be staying in one of the 14 cabins, all with air conditioning and a small bathroom. After a day of cycling it’s lovely to take rest on the sun deck. The sturdy Romantica connects romance with a modern and functional interior. You will immediately experience the attention the captain and his crew pay to achieve this elegant appearance. You will be staying in one of the 17 comfortably equipped cabins below deck. There are twins, doubles and triples; so great for families. On the main deck you will find the lounge where you can relax and enjoy your healthy breakfast every morning and well prepared dinners each night. The far sundeck offers couch mats for sunbathing and maybe a little nap. Because it’s your holiday!